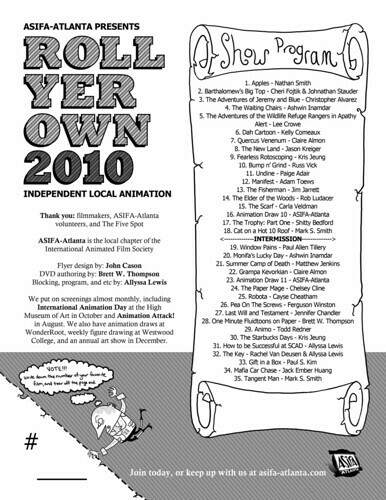 ASIFA-ATLANTA: Roll Yer Own 2010: Awards! Roll Yer Own 2010: Awards! Thanks so much to everyone who came to Roll Yer Own, to our amazing volunteers and board members (especially Allyssa, our vice president, and Fatimah, our secretary). 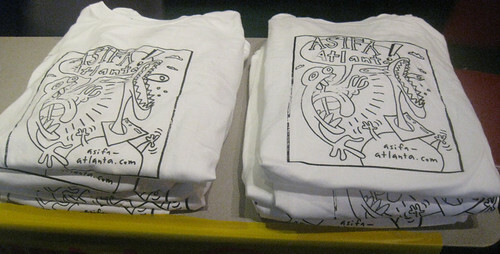 We also had shirts available for the first time in years- thanks to Chris at WonderRoot for helping me screenprint these!! I still have some left and want to make more soon. By purchasing one, you are directly supporting ASIFA-Atlanta, and we need help to get nonprofit status and continue to have events.